Arsenal have reportedly sent a scout to watch Cagliari midfield starlet Nicolo Barella in their clash with Juventus on Tuesday night. The 22-year-old has continued to impress this season, making 30 appearances for the Sardinian outfit while scoring one goal and providing three assists. Beyond the statistics though, his combative nature, energy, work-rate and quality on the ball have made him a stand-out talent in Serie A, while he has now earned five caps for Italy. That would suggest that he has a bright future ahead of him for club and country, but whether or not he remains with Cagliari to fulfil his potential remains to be seen. As noted by La Gazzetta dello Sport journalist Nicolo Schira in his tweet below, it’s suggested that Arsenal have sent a scout to watch Barella face Juventus, and he adds that the Gunners may have held an interest in him for some time. There is no better time to properly assess his quality though as facing Juve will be a major challenge, with Barella essentially testing himself against the best side in Italy and one of the best in Europe. Should Arsenal’s interest develop further, they will potentially have to dig deep into their pockets to sign Barella, as Football Italia note that Cagliari president Tommaso Giulini has previously suggested that they rate their prized asset at above €50m. 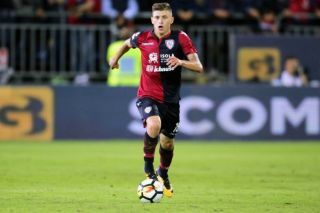 There is little doubt that Unai Emery could do with midfield reinforcements this summer, especially for a young player like Barella who would add a different dynamic to the side as he also has quality in the final third. However, that is a sizeable price-tag for a young player who has yet to prove himself consistently at the top level, and so it remains to be seen firstly if the scout reports back with a glowing report for the Gunners hierarchy.